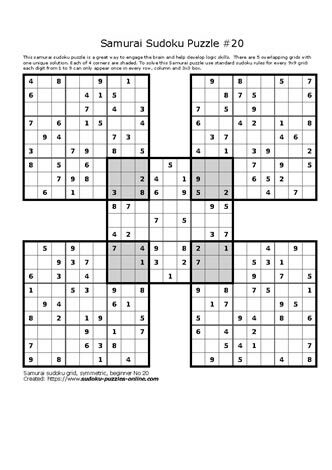 These brain teaser Samurai Sudoku puzzles are sure to give puzzle solvers hours of enjoyment and a great brain workout! Combine logical reasoning Sudoku's basic rules, to reveal the unique solution in this beginner fiendish Sudoku. There are 4 shaded areas in this puzzle. This highlights the areas that are shared with other other 4 Sudoku grids in the larger puzzle.